First United Methodist Church is currently sponsoring Boy Scout Troop 337, Cub Scout Pack 337, and Girl Scout Troop 20810. 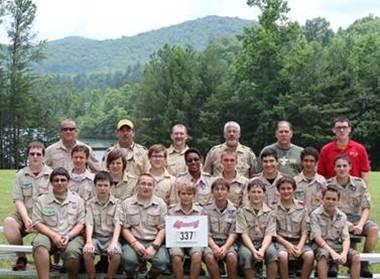 Boy Scout Troop 337 has been providing a quality Scouting experience for boys 11 – 18 years old for over 50 years! We offer a great opportunity to learn life changing skills, experience one-of-a-kind adventures, build life-long friendships and for each to have the best time of their lives along the way. We meet Monday nights at 7:00pm during the school year. For more information, check out our website or Facebook page. Cub Scouting is fun for boys! No matter what grade you are in, 1st through 5th, it can be a blast. Do you like to learn by doing? This is just the place. You can learn to tie knots, set up a tent, shoot a bow and arrow (archery). Have you ever cooked a meal on a campfire? Sent a secret code to a buddy? Built a bird house? Hike? Earn rewards for doing these things in Cub Scouts. Contact Patti Metlika for more information or to join the Pack.